How to use: Melt wax properly till it is visibly melted to liquid. Apply in thin layers on small patches on the skin.Then apply wax strip over the wax, press with hands and pull off the wax strip in the opposite direction of hair growth. 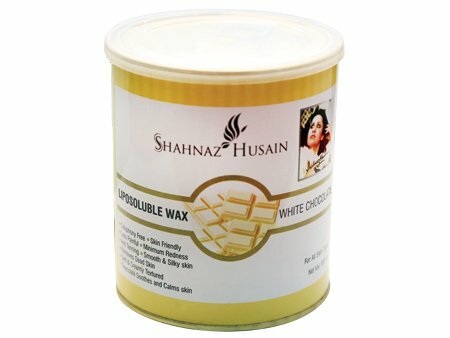 Shahnaz Husain has launched her latest innovation, the Liposoluble Chocolate Wax, which is based on an advanced and superior system of hair removal. It not only makes the waxing procedure smooth and easy, but is free of solid resin. It contains white chocolate and plant oils, which nourish and moisturise the skin. The formulation also has anti-inflammatory properties to soothe and heal the skin. With a soft, creamy texture, it is easy to spread and provides a smooth finish. It also helps to remove tan and dead cells, leaving the skin soft, smooth and bright. Known for product innovation, Shahnaz Husain has evolved over 375 formulations for beauty and health care. Going from strength to strength in the sophisticated formulation of products, the Shahnaz Husain brand name has received prestigious international awards for Quality Excellence. It has faced the most exacting test of all………the Test of Time!